I created drawings of all the Churchward and later classes for my book, "An Introduction to Great Western Locomotive Development" As a result I have a large library of pieces from the GWR "kit of parts" and there is an inevitable temptation to reassemble them in a different form. It is a temptation I have found impossible to resist, especially in "What If" topics on forums. So here are a few of my fictitious locomotives, the hopefully practical, the impractical, and the plain ridiculous. Some of these are loosely based on real proposals, but one should always remember that the drawing offices sometimes drew up weight diagrams of proposed locomotives in order to demonstrate why they would not have worked. This is definitely impractical, bordering on the ridiculous. A sketch to suggest that a Dean style large wheeled 4-6-0 would not have been a success. The low slung boiler requires a grate between the wheels, so the boiler is over-long, and the whole locomotive is badly proportioned. The boiler is completely imaginary, based on the Badmintons as built, and the rest of the locomotive is also mainly Badminton. This was a real GWR proposal, and according to RCTS it was drawn up around 1905. Its drawn with just 12 tons weight on each of the driving wheels, and a wheelbase of only 15ft 3in, fractionally shorter than that of a large pannier tank like the 2721 class. It would have had very wide route availability and power class B or C. Note the very high pitched boiler needed to get the ash pan clear of the driving wheels - the boiler is six inches higher than the 4400s. The original drawing has very little detail, and it seems likely the proposal was abandoned at an early stage. I've drawn an approximation of 1905 livery with no GWR branding on the tank as was typical at that time. I've given it the number 4201 as it would have predated the real 4200 class. The Great Bear with a combustion chamber boiler, somewhat patterned after the Stanier pacifics, and also treated to external axleboxes on the trailing wheels. If Churchward has favoured atlantics, and if the Great Bear had been a success, this is a 4-4-2 based on No 40s chassis with a shortened version of the Great Bear's boiler. In practice it would probably have had excess weight on the driving wheels and been rather slippery. One of my more ludicrous fantasies. Some of the early 42xx had their bunkers extended twice for more water capacity, the second time when they were converted into 7200 2-8-2Ts. Supposing if instead they were simply coupled with small tenders as water tanks? This is a short 19thC tender, with the coal space and hand brake gear removed and presumably an enlarged water tank. The assumption is that the water pick up gear is now steam operated remotely. A severe flaw in the concept is the water level, since the tender will be overflowing before the side tanks are half full. Perhaps it needs a very tall air vent? Due to the use of the short wheelbase tender the combination should still be able to be turned on a 55ft turntable. Great Western on both tender and locomotive looked odd, so I moved the number plate to the middle of the tank, where it had been on some earlier classes. A four coupled variation on the 5400 pannier tank. I'm a bit unsure about weight distribution. Its using the Std 21 boiler and most other components from the 54s. The leading wheel is large prairie sized. The 2-4-0 pannier tank redrawn with side tanks, and looking very like the Metro tanks in their final guise. The weight distribution might be a little better than the pannier tank. The modified 5400 again, this time in 0-4-2 guise. Its a larger and more powerful engine than the 4800/1400, but I think you'd be hard put to tell the difference at a glance. A really big passenger tank. 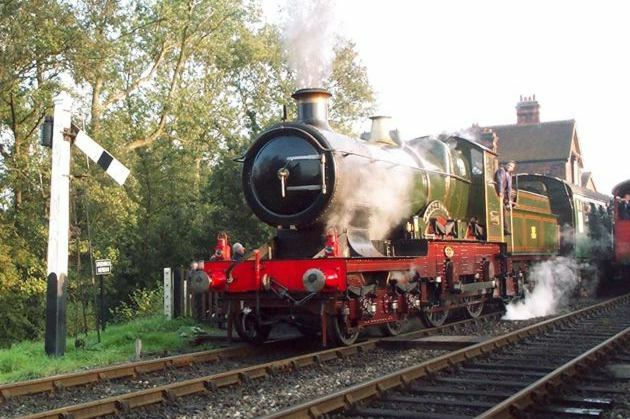 A tank engine based on the Halls or Granges would be well over weight, but the lighter and shorter Manor boiler ought to bring this 4-6-2 tank within red route restrictions. The chassis is basically Manor, with tanks and bunker styles after the large prairies and 2-8-0Ts. I don't think the standard kit of parts makes up into a useful 2-6-4 tank. This one has a new boiler, which is basically a Castle firebox and a Castle barrel shortened to Std 4 length. The Std 4 boiler is arguably a bit short on grate area, but this is probably the equal and opposite error. Its assumed that the side tanks are narrow and light, even narrower than those on the 2-8-0T, and the majority of the water capacity is in a tank under the coal space. Even so I have doubts about the weight limits. The rear bogie is also Castle. This drawing will get some more tidying up some time. With the same cylinders as a 3150 it wouldn't be any more powerful, but would have a good deal more steaming capacity if there were a use for that. In the 1930s the GWR had a number of new 5205 class 2-8-0T and no obvious work for them. As we know they were converted into the 7200 class 2-8-2T. But what else might have been done with them? Apparently at one stage Swindon considered rebuilding some of the 4200 class as tender engines with a Std 1 boiler, presumably as an alternative to building all new 2800s. This is my interpretation of the concept. Whereas this drawing is based on an original 1941 GWR drawing, which I didn't get to see until after drawing the one above. The biggest difference between the two is that the Swindon drawing office drew a very high pitched boiler, which gave room for the firebox to be over the third pair of driving wheels, rather than behind, as I drew it. They also raised the running plate to the level of the raised section over the cylinders to avoid the use of wheel splashers. Another 4200 rebuild, this imagines the locomotives rebuilt as small wheeled moguls. The adhesion factor would probably be distinctly unfavourable, with as much tractive effort as a Castle and rather less weight on the driving wheels. As the GWR was already converting 4300s to 4-6-0s at the time when there were new 4200s in store, its hard to see this would be a useful concept. This isn't as much a flight of fancy as some of the others. Ken Cook records that the GWR Running Department asked Collett for another batch of 4700 2-8-0s, but Collett eventually elected to build more Castles instead, as they would be similarly capable on fast freaight and better for relief passenger service. If Collett had elected to build more 47s they might well have looked like this. The frames are 6 inches longer at the back to make room for a good sized (by GWR standards at least!) side window cab, fire iron tunnel, and the suspension compensation has been removed. Other than that few changes seem likely, but I've also included screw reverse, which was designed but never fitted to the original class members in the 1950s. This is intended to be a very lightweight 2-6-0 to replace the Dean Goods on routes that were barred to the 2251s. Its a tender version of the 4575 small prairies, and is towing a Collett era version of the short 2,500 gallon tenders built at the end of the 19thC. The concept is that it would have unrestricted route availability and be able to be turned on 45ft turntables. RCTS records that at one stage, apparently under Hawksworth, consideration was given to reboilering the ROD class 2-8-0s with Standard 1 boilers. One presumes that at this sort of date some of the original boilers, which had been rebuilt by the GWR with copper fireboxes, were coming to the end of their lives. The conversion isn't altogether straightforward, and the back end of the smokebox looks rather cramped in my sketch. It may not be practical. These are all variations on the 15xx chassis. If it were decided to replace the 5700 fleet with outside cylinder 0-6-0s then this sketch shows the P class boiler on a longer wheelbase chassis with 1500 valve gear. Route availability should be appreciably wider than the 1500s. A 2-6-0 based on the 1500 chassis and valve gear. Heavier than a 2251, but with the same boiler, the Std 10. It would probably be little more capable than the 2251 and less powerful than the 43s, so there's perhaps not much to say for it. This flight of fancy is also fundamentally based on the 1500 chassis, but is a little longer than the one above in order to feature a standard 4 boiler. It would be rather heavy and limited in function, but perhaps not unattractive. The short wheelbase might make it something of a rough rider, and maybe it would be better with the trailing wheel moved backwards. It could be regarded as a modern equivalent to the Aberdares I suppose. A standard 2 boiler would possibly knock it down a weight class at the price of less steaming capacity. It followed a logical process. Honest! There was a logical sequence of thought behind this bizarre confection! A imaginary locomotives forum discussion proposed a 2-6-4 tender engine with a Manor boiler, and I had a bit of a play, but couldn't get anything that looked practical. Within the general Swindon narrow firebox outline a pair of trailing wheels looks more practical to me. I started sketching what might have been a sort of small 4700, but it didn't seem to have a role against existing classes and the 5ft8 wheels were problematic for space under the Manor boiler. Then a discussion on a different forum about the perfect preserved line locomotive came to mind. So I thought. OK, what about a Manor boiler and mainly 4575 components for a sort of small 4200. Sketching it quickly though it looked very ill proportioned with either a large rear overhang or an excessive long fixed wheelbase. A 2-8-2T still had a rather small bunker, and good water and coal capacity is important on some of the preserved lines, so that didn't seem too valid either. So at that point I sketched out this, which is still pretty oddly proportioned, but makes a kind of weird sense. Manor boiler with extended smokebox, Manor front bogie at the rear, most of the rest modified 4573. An uprated version could have Manor cylinders for greater power, but clearance problems on some lines. It would probably have good route availability - GWR blue restriction ought to be possible with appropriate sizing of the side tanks - and a decent amount of adhesion. But I still fear its rather ludicrous! This is a "what if British Railways had built a standard class based on the 1500?" A domed version of the Std 10 boiler with pop safety valves and an LMS type bunker. The 1500 is rarely accused of being especially pretty, but I suggest that its Emma Watson alongside this imagined beast. As soon as that bunker replaced the GWR one in my graphics application the looks went out of the window. Return to the GWR Information Index Page. The original articles on these pages are mainly contractions from my book, "An Introduction to Great Western Locomotive Development", a study of Great Western Railway locomotive classes, which is published by Pen and Sword Books. You may order it from here.